TrévoTM utilizes a powerful, yet simple, concept of business-building that shows you how to identify the types of people who will be attracted to your business and in what capacity. The obvious benefit of this type of knowledge is that, by identifying and understanding the type of people with whom you want to do business, you can actually hand-select the perfect business partners. Together, you can achieve long-term success in an amazingly short period of time by creating an organization of satisfied customers and passionate Life and Health Coach team members. When you become a part of TrévoTM, you will discover your destiny as a global mover and shaker; someone who not only dramatically changes his own life but also the lives of those around him. Our goal is to empower you to become a successful home-based entrepreneur who enjoys the best of all worlds: a highly profitable global business paired with the time to enjoy the fruits of your success. The next time you visit a Starbucks or Panera Bread, take a quick look around. If you see a bottle of TrévoTM sitting on a table surrounded by a group of people laughing and having fun, then you will begin to understand what we mean by a new way of doing business. 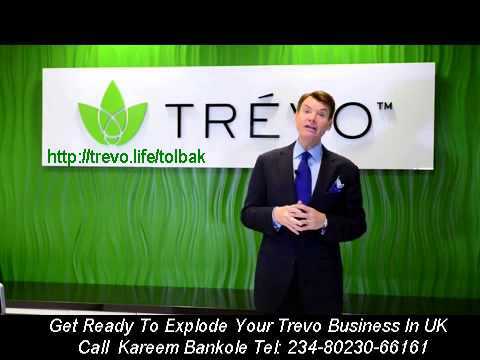 TrévoTM is fun, it is empowering, and you will find that it is definitely profitable. Take a result-oriented product that eliminates the need to take handfuls of pills and capsules every day. Add in an extremely generous compensation plan and an experience-based business system, and what you now have is absolutely no competition. TrévoTM represents an exciting, dynamic business opportunity in the soon-to-be one trillion dollar health and wellness sector. By offering such a one-of-a-kind product, we have set our company apart from the crowd of competition. Containing 174 of the very finest natural ingredients gathered from around the globe, TrévoTM gives your body the complete nutrition it requires while also creating amazing energy, enhancing your mental focus, and giving you a wonderful sense of well-being. And because it is a liquid, Trévo’sTM super-nutrition is utilized by your body almost 100%, compared to only a typical 10% to 20% absorption of pills. And while TrévoTM is a new product, it has a very impressive track record. We invested 2 ½ years in intensive research, development and successful testing on this product, and we know that it is changing lives and improving lifestyles. Our manufacturers are world-class facilities that closely adhere to cGMP (Current Good Manufacturing Practice) safety and quality standards, and our product formulators are recognized as some of the foremost minds in their industry. In other words, TrévoTM is on the cutting edge of nutraceutical science.